Bathroom Vanities and Accessories Design and Tips | DecorPlanet.com Blog: Why should you choose a double bathroom vanity? It's been said that couples with separate bathrooms get along better and are happier together. In fact, celebrity couples including Victoria (a.k.a. Posh Spice) and David Beckham, as well as Catherine Zeta Jones and Michael Douglas, admit to having his and hers bathrooms. "Separate bathrooms is always a really great idea," Zeta Jones told The Sunday Times. "Mine is so messy, I'd absolutely hate for my husband to realize just how incredibly cluttery I can be." While celebrities often have both the space in their mansions as well as the money needed to build separate bathrooms, most people may not. 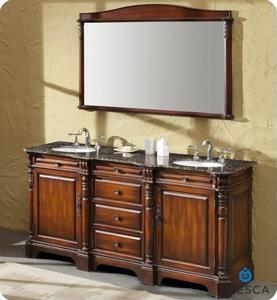 The solution for the rest of us: a double bathroom vanity. According to NouveauBathrooms.com, separate sinks as well as individual counter space and under-the-sink storage space can help individuals keep the peace just as effectively as separate bathrooms. When getting ready at the same time each morning or preparing for a special night out together, having your own space, rather than jockeying for a look in the mirror or a turn at the sink, can be priceless. A double bathroom vanity is also more hygienic. "The chance of contracting an illness or sharing germs, viruses or bacteria with a family member is greatly diminished when dual sinks are used and each person has their own dedicated sink," states the website.